Well, look at this. My North American debut. When I was an actress I thought that word only applied to performance but, no, it's what publishers say about books as well. A person's first appearance or performance in a particular capacity or role. Synonyms: first appearance, first showing, first performance, launch, launching, coming out, entrance, premiere, beginning, introduction, inception, inauguration. I may substitute it for "debut" in conversation from now on. I've always been a sucker for synonyms and dictionary definitions, which is one of the reasons why working with my US editor on The Library at the Edge of the World has been such fun. The book, the first in my "Finfarran" series of novels, is already available, with two others, across Europe, and in Australia, China and South Korea. In the case of the latter two, the covers are stunning but I've no idea what the lovely typography actually says. My name and the title, obviously. But which is which? When it came to preparing the US and Canadian edition I'd never imagined there'd be issues of translation. But, of course, in a way, there were. The book went through a process known as 'Americanization' (note the 'z') in which spelling, grammar and, very occasionally, idiom were checked and changed where appropriate, for North American readers. It was fascinating. As Oscar Wilde wrote in 1887 "We have really everything in common with America nowadays except, of course, language". Or as George Bernard Shaw said - according to Reader’s Digest, November 1942 - "England and America are two countries separated by the same language". The manuscript, in digital form, went to and fro across the ocean, with my editor and her colleagues meticulously checking every point with me. 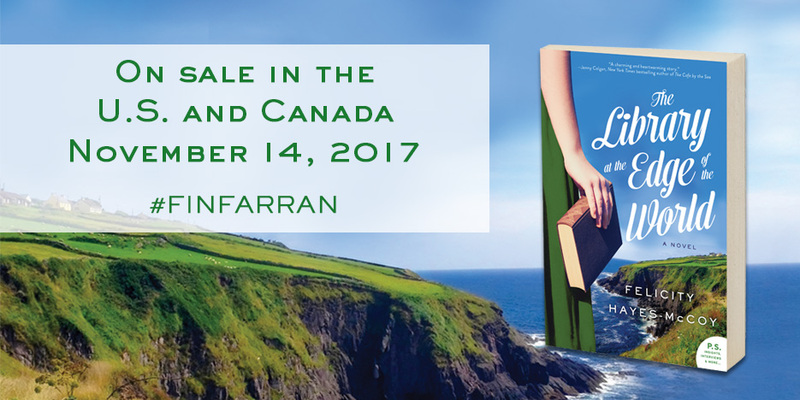 This is a life-after-divorce book about family tensions and rediscovering roots in a tightly-knit, small-town Irish community. So would it be okay to change the word for a piece of furniture in Maggie's house from the Irish "dresser" to the US "hutch"? Definitely not! What about changing 'petrol station' to 'gas station'? Absolutely. And 'mobile' to 'cell phone'? But of course! The conversations continued over a period of weeks.There was careful consultation about the differences between "timber" and "lumber", and the correct words to describe the materials Fury O'Shea stripped from Hanna's roof when her back was turned. There was the knotty question of whether or not "a súgan chair" needed to be explained. And that heated moment when we faced the fact that there isn't an American equivalent for Jazz's favourite childhood treat "fat chips". And always there were reassurances, in phone calls and in emails, from my editor. "We want to be sure to preserve the characters' voices". "We mustn't lose the shape and the flow of the text." They didn't. The result is a beautiful new edition, and an author who's had a brilliant time browsing through US dictionaries - and, incidentally, discovering how often "Irish English" echoes the rhythms and vocabulary of the English carried by America's Pilgrim Fathers on their long journey from Plymouth . Nothing had prepared me for the unexpected pleasures of my own editorial journey. And now the books are off on their way to US and Canadian bookstores (note "stores", not "shops" 😉), with lovely jackets and a new fifteen-page "PS Section", full of background material about my fictional County Finfarran and my own Irish home. I hope North American readers will enjoy it. I know from your messages and emails how many of you have been waiting for it. So do, please, share this post and tell your friends about the kick-off (coming out, entrance, premiere, introduction ... debut!!). 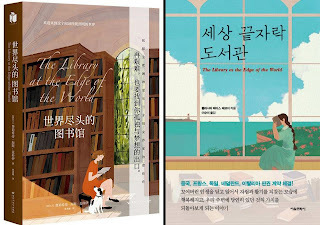 Just finished reading The Library at the Edge of the World - thank you so much - what a good read! It was so nice to read a book that made me feel so good after reading it. Look forward to your next book and the pleasure of reading it. Good to hear that you enjoyed it, Sally, and thank you for letting me know. The fourth Finfarran novel, The Month of Borrowed Dreams, comes out here in Ireland in June, and Summer at the Garden Café, the second in the series,will be out in the US later this year, followed next year by the third, The Mistletoe Matchmaker. Wherever you are, I hope you'll continue to read and enjoy them. If you're on Facebook and would like to follow my Author Page you'll find updates there about the Finfarran books, as well as about my other work and life here on the Dingle Peninsula. Many thanks again for getting in touch. From the US, I loved reading The Library At the Edge of the World! Now I'm waiting as patiently as I'm able for the next Finfarran novel to show up in the US. Today you announced that Summer at the Garden Cafe is on UK Amazon in Kindle format. I can't get it , though! How frustrating! I would love to be able to read the UK version! Thank you for your wonderful words and storytelling, Ms. Hayes-McCoy. I'm so glad you hear that your enjoyed The Library at the Edge of the World. A print edition of Summer at the Garden Café comes out in the US and Canada late this year but if you'd like to read the UK and Irish one you could order that now from The Book Depository. Readers tell me it offers a very reliable service, and delivers free worldwide. I've pasted the link here below in case it's useful. I do hope you enjoy Cafe when you come to read it, and, of course, the subsequent Finfarran novels as well. All good wishes and thank you for your kind message ~ Felicity.